Blake W. Rebling – Associate – Salmon, Lewis & Weldon P.L.C. Blake Rebling concentrates his practice on commercial real estate and business transactions. He represents lenders and investors with construction financing, including mortgage loans, mezzanine loans, and equity investments. Blake also counsels landlords and tenants with office and retail leases, and he represents developers with acquiring and selling commercial and industrial properties. He assists clients with deal negotiation and with the review of title, survey, environmental, and other due diligence matters. Since 2013, Blake has represented lenders with the placement of $850 million of loans and investments, including more than $500 million of construction financing for projects with aggregate budgets totaling $2.3 billion. 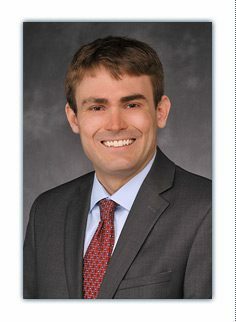 Blake previously worked as a commercial litigator focusing on title-insurance claims and construction-defect matters. He has also served as a judicial law clerk to the Honorable Ann A. Scott Timmer of the Arizona Court of Appeals, as a legal intern for the Arizona Governor’s Office, and as a legal extern for U.S. Senator Jon Kyl, where he worked with Judiciary Committee staff during a U.S. Supreme Court nomination.